Producing a sequel to a popular game or toy can be a double-edged sword for toy manufacturers. They must walk the line of appealing to the predecessor’s existing fan base while providing enough differentiation and new features to appeal to a whole new generation of consumers. Parker Brothers made two attempts to re-capture the magic of Merlin. The original Merlin – the Electronic Wizard was released in 1979, went on to sell over 5.5 million units, and was a staple on Coopee family car trips. 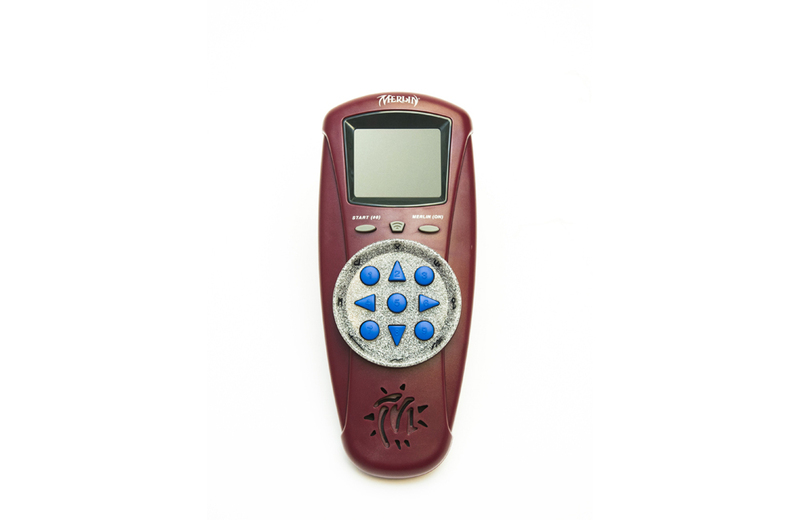 1982 saw a new release of the handheld electronic game, this time called Master Merlin. Then in 1995, Parker Brothers followed up with Merlin: The 10th Quest. Merlin: The 10th Quest mixes things up by featuring 10 games (up from 6 in the original), all with a fantasy theme. With game titles like Swords & Shields, Castle Keep, and Spell Bender, this single-player game is slightly larger and rounder than the original and was designed to tap into the popular Dungeons & Dragons trend of the time. As players progress through nine challenges, they earn a reward (displayed on-screen) for each game completed. For every three games completed, players also rise in level, advancing from Apprentice to Squire, and finally, to Knight. Upon completing the ninth game, Merlin audibly announces, “Brave Knight, the challenge awaits!” and unlocks the 10th and final game, a maze complete with disappearing and invisible walls. When a player escapes the maze, Merlin declares: “Congratulations! You are a Master!” and displays the player’s time. The VertiBird line of toy helicopters combined simple flight simulation with crime fighting, search and rescue, and space exploration operations – an exceptional play experience for children who wanted to create their own adventures. Released in the early 1960s by Hasbro, the Frosty Sno-Man Sno-Cone Machine allowed children to beat the summer heat by preparing icy treats themselves.